This “classic” bib is designed to shed wind and rain and keep you warm and comfortable for longer periods of time when hunting in the stand or blind during colder weather. 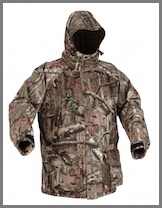 This “classic” parka is designed to shed wind and rain and keep you warm and comfortable for longer periods of time when hunting in the stand or blind during colder weather. 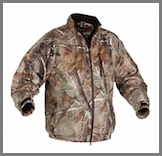 This jacket is constructed of a quiet, bur-free micro suede outer shell and polyester lining which seals in your body heat and shields you from cold winds and rain. 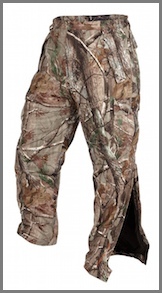 This pant is constructed of a quiet, bur-free micro suede outer shell and polyester lining which seals in your body heat and shields you from cold winds and rain. ArcticShield Ice Shelter Double Layer. 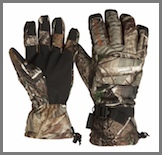 A versatile, two glove system, the ArcticShield Lined Camp Gloves give hunters the same warmth as thicker gloves, but without the bulk. ArcticShield Performance Fit Camo Bib. Silent, waterproof, wind resistant performance. These key features actively describe this versatile jacket and bib that will allow you to remain warm and comfortable while spending an entire day in the field. ArcticShield Performance Fit Camo Jacket. Silent, waterproof, wind resistant performance. 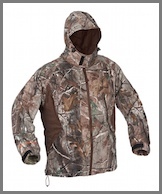 These key features actively describe this versatile jacket that will allow you to remain warm and comfortable while spending an entire day in the field.